“O my Jesus, forgive us our sins, save us from the fire of hell, lead all souls to Heaven, especially those who have most need of Thy mercy.” (To be said after the Glory Be prayer following each decade of the Rosary). Throughout the world, people begin to prepare for the feast of Christmas. Many do so in a very sincere way. How different the original Christmas and the Christmas of today. The birth was unknown to the world. The light had come but only the shepherds shared in the story. How much more was to unfold, with John the Baptist preparing the way. Then, my Son came onto the scene, anointed with the Holy Spirit and power. All the events unfolded, prophesied ahead of time, and culminating in his death and resurrection. Since then, the gospel has gone forth, preached to all the nations and drawing all who believe into great light. Now, everything is threatened. The work of centuries is being attacked as never before. The darkness is trying to put out all the lights of Christ and to erase all the faith. Satan looks forward to this coming year. Some he will destroy by death but their martyrdoms will become eternal lights, always lighting up the heavens. Even more, he will try to destroy by fear, when the disasters will shake people’s faith. But most of all, he will try to conquer by despair, when so many surrender to the seemingly hopeless situations which they will face. Where is my Church? It will proclaim the truths as usual, and this is its task. But, this is not enough. My Church will need help, my help. So, these words are for my Church in this coming year of 2012. You have the deposit of faith but you do not have within your grasp what you will need to sustain your people in faith, in the face of all that will occur in this coming year. You are weak. You are helpless. Your light is not strong enough. Your lights are fragile and vulnerable. You are not ready for the assaults of darkness. How clearly can I speak to you? Whole sections of the Church are ready to be swept into darkness. The work of conversions done over centuries is about to be toppled. You will see it before your very eyes, like a mother viewing the death of her child. What can I say to you? How much must I warn you? Go to Fatima! Take all the believers with you. Go to Fatima as quickly as possible! All that you need lies in my Immaculate Heart at Fatima. Do not listen to those in high places who caution prudence or who tell you to wait. Holy Father, lead my Church to Fatima. Why are you waiting? What is the delay? If I had not spoken, if I had not appeared, if I had not placed the treasures there, then I could excuse you. Things would not be so clear. Clear away your desk. Set aside the other issues. Proclaim a year of Fatima. Be very specific. Get people to read my messages. Get them to understand the great blessings that remain unopened. People need concrete advice on how to walk. This is a clear path. Before the destruction begins, I want my whole Church to go to Fatima. I will be there. Let no one ask in the middle of all that will happen, “Where is Mary?” I have told you where I am. Those who go there, in body or in spirit, will be kept safe. Everything is going in reverse. Power is slipping away, both from world leaders and Church leaders. The bonds of stability that held the world together are loosening. The world does not know what to do but the Church knows and the Pope knows. The Pope must cut away those who tell him to stay away from Fatima. They are the voices of Satan and need to be silenced. The Pope must draw near to Fatima. He must study Fatima. He must encircle himself with advisers who both know and love Fatima. He must preach on Fatima. He must instruct the whole Church. He must tell the bishops that they are to fully embrace the message and teaching of Fatima. The Church of 2012 must become a Church of Fatima. Only in this way, will the Church begin to take the right road. Do not be afraid of those who will raise their voices against this. I will bring the people back to the sacraments. This will quickly prepare for the Consecration of Russia. Fervor will return. Hearts will see the great mistakes they have made. There will be a gigantic “turning back”. However, the effort must be “all-out”. A letter will not suffice. A homily, here or there, won’t even be noticed. Even to speak of me in a general way, will gain no attention. So, I speak to my son, my beloved Pope. Place the light of Fatima in your own heart. Let that light grow. Let that light diminish all the other lights, even the brilliant light of your human plans. The world, at this point, does not need your theological teachings, (as brilliant as they are). They need my simple teachings that I gave to the three children, especially to Lucy. She is a light placed under a bushel basket and it is time for you to put her on the lampstand. I would gather my people, but all are scattered. They are consumed with other tasks. “What I am doing for the Church is important”, they say. “I am carrying out an important work of evangelization”. They go off in their own directions. They are scattered children, each carrying their little light that is quickly swallowed up in the darkness. I must call my children together. I must say to them “Put away the lights of your own minds and your own wills. Take my light. It seems small now but if you but hold it in your heart and lift it high for all to see, this little light will grow. This light contains within it unique powers”. I will explain these images. The Catholic Church has many, many good people who are sincerely interested in its welfare. However, they are scattered. They are not drawn together. They preach and work very hard but the results are meager and they grow disheartened. They turn to others for advice. They go to workshops to learn what the experts are saying. One year they try one thing and the next year they try something else. Their efforts are sincere but the good effects flow away like rain water down a sewer. Why does this happen? Because they turn to their experts instead of turning to me. They work according to the ideas of man instead of by the light which their heavenly Mother has provided. That is what I mean when I say “They are scattered and concerned with other tasks”. My plan is to gather them and to give them my light. Many have set me aside. They have relegated me to “Marian devotions”. They have never learned the central truth of Fatima. At this moment in the world’s history the heavenly Father has decided to exalt my Immaculate Heart. This century will see the triumph of my Immaculate Heart. That is the Father’s pastoral plan and it contains all wisdom and all power. Yet, many sincere workers in the Church set aside this plan. They substitute their own. This is why the Pope must call a year of Fatima. All the Church evangelists, preachers, pastors, catechists and people must get on the same page. They must get on my page because their page is useless. I bring forth the secrets of Fatima, revealed so clearly to the children and inscribed indelibly into their memories. I speak today about what is called the Third Secret, revealed on July 13, 1917 and obediently recorded by Lucy for her bishop. This secret was to be published in 1960, but was kept hidden and even until today, is not fully revealed. What right does the Church have to set aside my commands and to keep hidden those secrets that should be revealed? What right does my Church have to falsely interpret what is revealed, as if the events have already been fulfilled when really, they lie in the future? This must end. Fatima must be placed immediately on the lampstand and the first step will be for Pope Francis to reveal the entire secret and to acknowledge that these are future events. Yes, a future pope will be killed, but that is only one part of what is still to be revealed. Fatima is a rich source of blessings. The site itself is made holy by my visits and by all the pilgrims who continually show their devotion. The messages have been faithfully recorded and Lucy, for many decades, was my most faithful of messengers, doing all that she could possibly do to bring these riches to the Church. These riches are in the Church. I have deliberately deposited them there so that there is no question in the world’s mind of my love for the Church and my desire to exalt the Church. I will never remove these gifts from the hands of the Church. How patient I have been. How many years I have waited. The Church does not open my gifts. The world is deprived of the light. The wars spread. The devastation increases. Yet, I wait and wait for the Church. That is my plan. No other way exists. I come to the heart of the issue. When I appeared to the three children (1917), I foresaw all that would occur in the 20th century. I saw the forces gathered again for war. I foresaw the great destruction reeked by the opposing armies. However, during that war many called out to me and I brought it to a conclusion. Quickly, other forces arose and the Cold War began. This, too, I brought to an end. However, scattered throughout the world, many smaller destructive seeds were sown and now they have coalesced. They are active in every nation and, because not linked to one nation, they are difficult to turn back. The world sees itself as helpless and on a road of destruction. This is true. I must say the time is short and the road ahead is beyond human imagination. So, I have raised up this tiny voice, still hidden, which proclaims my words. Listen carefully, for I will use this voice time and again. The mountains of destruction now surround the world and they grow higher each day. Where lies the path to peace? That is the real secret of Fatima. The more the darkness grows and the more that the solutions of man fail, the greater must the light of Fatima become. Who will find this path? Who can lead the world on this path? Only my pope. The world does not even know Fatima or that such a path exists. Only my Church realizes, through the great revelations, that I have foreseen this era of great darkness. Almost a century ago, I saw clearly the darkness that would envelope the world at this time. I acted. I revealed. I spoke. I gave messages. If this light were accepted I would give greater light. Only my pope can lead the whole Church on the path of Fatima. Other voices are raised on behalf of Fatima. These are very clear voices, but they are only partial lights, little lights keeping alive the message. Only the pope can lead the Church on the path of light through these mountains of darkness and destruction. I must speak of the power of the light of Fatima. Right now, the forces of darkness seem to be powerful, but their power is a lie. They seem to be well-built and united (a growing union of which I have spoken already) but this is not true. Their building is not based on God’ word and any such building will collapse when the floods come. Also, their union is not a oneness of love but of hatred and only love is the bond of peace. They have great power because of darkness. The minds of people are clouded. The leaders of Russia and Iran could easily be toppled if people enjoyed the light. I know the weaknesses of their structures and of their oneness. I know how to remove darkness and lead people to light. This is the power of the light of Fatima and a promise of the great changes that can take place if Fatima is placed on the lampstand. All the darkness converges, like clouds gathering in the heavens. Who cannot see what is before your very eyes? “The rains are coming” people will say and all will agree. All can read these signs. Then, why not read clearly the events happening before your eyes? Can suddenly the sun appear and scatter the clouds? Can all the signs be wrong and no rain fall? Did not the sun dance at Fatima? Am I not the woman clothed with the sun? These are the secrets I have tried so hard to reveal. Yet, few listen and few believe. Come, join my army. Promote my Fatima messages. Use your rosaries daily. It is not too late. The sun of Fatima is rising not setting. No one can know what the history of the 20th century would have been, if the Church had fully accepted my Fatima gift. So, no one can imagine what will happen when the Church places full faith in Fatima. First the Church must have full faith. Before consecrating Russia to my Immaculate Heart, the Church must proclaim to all the world what she intends to do. She must boldly announce that enormous changes will occur which anyone can see. There will be the toppling of dictators without a single shot being fired. Leaders of governments will be drawn out of darkness into a new light of truth and justice. Blessings will flow into family life. Young people will be attracted to goodness and those who now control the mass media that discredits morality will themselves be discredited and set aside. These are all the blessings that are waiting to be released. Everything is at stake. Everything is on the table. Even though the fires burn in the Middle East, all the world will be drawn in. If a body is wounded, the whole person suffers. The Evil One wants to pierce the body and bring about a mortal wound that will not heal. This is a wound of untold suffering and tragic human loss. I do not want this moment to ever happen. I am acting everywhere. I am appearing to some, speaking to others, encouraging and leading. I am opening up my heart and welcoming everyone. These are the actions that I will begin to explain. You, reader, are the object of my actions and I want you to understand all that I am doing. God created a garden of life which was meant to bring mankind every blessing. By human choice, it became a garden of death and disobedience. For man’s own good, he had to leave the garden. At the same time, God promised another garden, a woman who would bring forth a son. I am the new garden. However, all must find their way into my garden where there is life and obedience. This is the great mystery which is being revealed to the whole world. Some already know this truth and in me they find life. However, many do not know me and many who do know me are unaware of this garden. In the future, I will manifest my presence, not just to Catholics but to all of good will, and I will invite all into my garden of new life. I have so much to say about the Fatima gift that has never been revealed or explained. Placing my light on the lampstand is just the beginning because everyone in the world, to some degree, is in darkness. Even the most devout souls have aspects of their personality and of their holiness that are touched with darkness. To these I will offer a fullness of light. The final darkness will be thrown off. This will happen by a gift of joy. I will so fill them with my presence and their hearts will so rejoice that whatever darkness still lurks in the recesses of their hearts will be burned away by the greatest of joys. They will drink of a happiness that they could not imagine and they, too, will write of my wonders so all will know of this new age. When the age of Fatima dawns, should it not begin with those who have been so faithful to me? In the original Garden, there was a presence of God, a familiarity between God and man, and a loving relationship. Today, in the midst of their sufferings, people ask “Where is God”. People experience an absence of God because he seems so far away as if he is not interested in creation. The Fatima gift contains this presence of God. People will sense that God is with them. They will see that he truly is a loving Father. The goal of Fatima is to restore what was present in the beginning, so all mankind, by experiencing a presence of God, is free to respond. Now, just a handful have this experience of God’s presence which helps them to be faithful. In the new era, the age of Fatima, this gift will be offered to all. All will be invited into the new garden. Even the Church does not understand. I must explain even more deeply the gift of placing Fatima on the lampstand. This, of course, is a decision of the Holy Father but all the bishops and, all the Church with them, must be involved. All must know of this moment and all must prepare in the greatest of faith. Doubts and fears must be cast out. This moment will have great results. A special day must be chosen and all will agree that this is the perfect choice. Of course, Satan will stir up the forces of nature all across the world. However, this will be a sign. The physical light of the sun casts out the darkness and the seas will be stilled. Then, will come the great moment. All the Church will have been praying fasting and expecting. When the words of consecration are said, the gift will be sealed forever, totally protected because the whole Church has fully participated. How I look forward to that day. Darkness covers the whole earth. This darkness is not perceived because it lies in the heart of every person. This unperceived darkness also exists in the structures of human society. It governs the relationship between nations and the relationships between people, especially in the most important place of all, the family. From this darkness comes every human problem and the inability to finding lasting solutions. From this darkness comes the multiplication and the complication of these problems. Every problem of mankind flows from this darkness which has now led man on this road of destruction. No human power can free him. Every human attempt only shares in this human darkness. A new light is needed, a light that has nothing in common with the darkness. When will the pure light of Fatima be released so the darkness can be overcome? Blessed are those who work for this goal. Woe to those who speak against it. Fatima is like heavenly rain that will dampen the whole world, extinguishing the fires that now blaze out of control. These are the great fires of anger and hatred that exist between people and cultures, the fires of greed and dishonesty in the hearts of leaders, the fires of passions and deceit in the hearts of individuals. All of these fires will begin to face a new enemy in the heavenly rains of Fatima. Man cannot put out these fires. He does not even understand them. He is totally helpless in the face of the demonic destruction. However, Satan knows that his fires, no matter how powerful and widespread, are no match for the heavenly rain. That is why he fears so greatly the unleashing of the Fatima gift. I will continue to speak of the hidden powers of the Fatima gift. Mankind has suffered from the waves of iniquity which have continually washed upon its shores. The first wave prepares for the second, which is always more powerful and more extensive. When one wave ceases, the other comes, extending the evil. Is not the shore helpless against the waves? Can the shore say to the ocean, “Send me no more”? Even if some resist the evil, yet another wave, and another, quickly follows, eroding every barrier. Such is the current state of mankind. I promise you a new ocean, the ocean of Fatima blessings, which will constantly beat upon the shore, removing evil and giving hope, turning back the terrible gains of inequity and restoring religious life. I promise that these waves will not stop. Human efforts to block them will fail. I will gather a people purified in my ocean. Mankind is helpless and wounded. Like the man who fell in among robbers, he lays by the wayside and so many pass him by, until someone stops and bows down to see his plight. At Fatima, I have come down because I saw the state of mankind. Now, the wounds have multiplied and the helplessness spreads everywhere, like a growing infection. Fatima is my pledge and my promise. I will continually come down. I will come down everywhere, especially when I am asked. I will come down to nations, to families and to all who are in need. I will come down in public manifestations and quietly within people’s hearts. The whole world will experience my care. Whatever the cost, I am ready to pay the innkeeper. What do I ask of you so that these Fatima blessings are received? First, you must believe in me and in all that I have promised. My name must be on your lips and in your heart. You must trust and be filled with confidence that my gifts are all you need for your eternal salvation and your earthly happiness. Second, you must love one another and forgive what happens each day. You must be concerned that everyone knows and loves me. No one must be left behind. Finally, you must keep God’s law. At this point, many falter because they fear. I will help you. I ask only a willing heart that tries each day to fulfill God’s will. Fulfill these three requests and the ocean of Fatima will fill your life. I raise my voice strongly to Church leaders – bishops, priests, deacons, religious, laity in key positions. You must join me. You cannot sit on the sidelines. Your voices also must be raised. Where your heart is, there also should be your voice. You must encourage the Holy Father. Let him know that you support him and want him to consecrate Russia to my Immaculate Heart. When he sees your overwhelming support, he will move much more quickly. He, too, will see the urgency and the fruitfulness. He will see that consecrating Russia will unite the Church, not divide it. This, however, is not enough. Is there not a part of the Church, no matter how small, in which you hold some role of authority? Consecrate that part to my Immaculate Heart. Get your people to make their consecration. I will see their holy desires and I will come. I will make my presence known by signs and my power known by miracles. These graces I pour out upon all who openly profess their devotion to me. What is hidden must be revealed so that all eyes are opened to the realities of these times. Otherwise, mankind, in his confusion, will have no response. Let me begin. For centuries, heaven has foreseen these years that lie immediately ahead. The storm clouds began to gather when the goddess of reason was exalted during the French revolution. Even then, the Father was ready to answer. I began appearing in Paris to St. Catherine and then at Lourdes to Bernadette. The Father was taking the war to the very soil of France where the evil had begun. The Age of Enlightenment was its name. Truly, it was the beginning of the Age of Darkness, the stripping away of supernatural truths. In the twentieth century, a greater evil was sown on the soil of Russia, which claimed millions of lives, spread its errors, and continues to this day as the source of turmoil. The greatest of all evils is blindness to these forces, which are shaping today’s events and preparing for future events. No one sees. Not even the Church sees. There is no awakening, no trumpet call. No one is aware of how near are these future events. When the problem was in France, I appeared in France. When the problem was Russia, I spoke at Fatima about Russia. No human solutions exist for these problems but I am waiting to act, to come upon the world scene and even to manifest my presence to the whole world. I speak because I want every eye and every heart to turn to me and to invoke my help as the Woman Clothed With the Sun. I want the Holy Father to consecrate Russia to my Immaculate Heart. I want all the bishops to support and participate in this consecration. I want all the faithful to join wholeheartedly in a permanent consecration of their lives to me. Nothing less is enough. 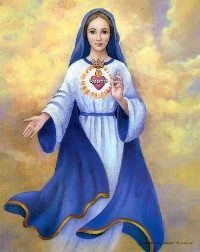 If I am to rescue the world, I need a total, complete, life-long consecration to my Immaculate Heart. The hour is late. This should have been accomplished decades ago. Another decade of waiting will result in complete disaster.